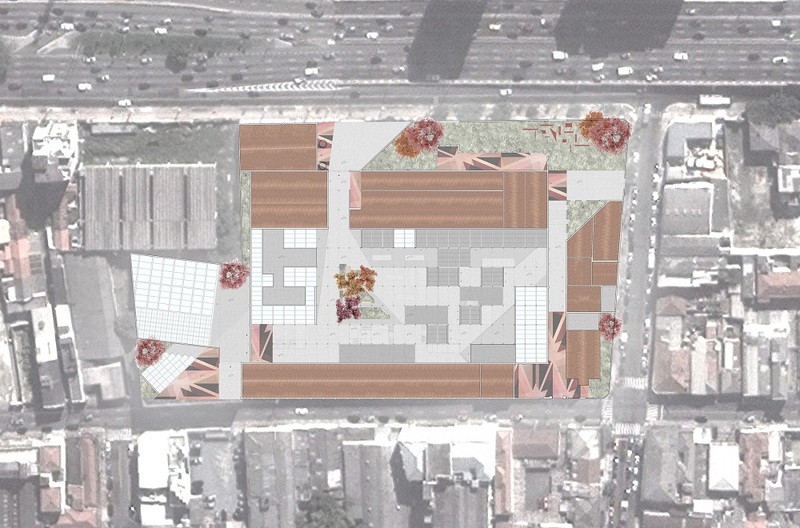 MuSeu is a transformation project for Fábrica do Tecidos Labor, a former industrial site in Mooca, São Paulo, Brazil. The project is also a highly personal quest for a design approach deeply connected with the country’s cultural identity and the troubled social context. The Graduation project ‘Transformation: from industrial sites to cultural identity’ is structured through a research group period and an individual progress of the design of the project itself. The transition from one phase to the other is defined by the development of the project brief, where, taking the research as a starting point, the scenario of the design approach is set up. The interest towards Brazil has characterized my personality since many years ago, without any particular reason but always felt as an irrational call. The research and in particular the mapping exercise, enable me to feed my curiosity about the Brazilian culture and in particular about Sao Paulo and Mooca. Academic and visual acknowledgments, such as books, movies and various papers, have given the idea of a country characterize, by a strong contrast between multiple issues, where the actual contrast is the key to read things together and get the overall image of their culture. A strong passion leads everything: tastes, flavors, colors, rhythm, violence, sounds, images, and the contrast between them seems to be the key to understand the co-existence of all the parts at the same time. Even though it is possible to criticize their system, the observation and the analysis of it have pointed out strong features characteristics of the above mentioned country. It has been definitely worth it to look at the city and neighborhood level in order to grasp their hidden gems. The research has always been driven by the definition of cultural identity and transformation. The more the research have been defined, the more the definition of them have become wider and wider but at the same time, narrowed and clear in relation to the decisions about my design task. During my research there have been many diverse layers which have enriched my process. Firstly, the most valuable source of inspiration it has been the culture itself. The striking dynamics in the society and the contrasting realities leaving side by side in the cities, it has provided the ground layer of my design. While researching these topics, the nature of the society has invited me to study the history of it, from a social point of view. Therefore, documentaries, written interviews with ex street children, movies and books written by Jorge Amado (especially) have enabled myself to dive in the culture and its atmosphere. Moreover, nowadays street artists such as Kobra, cultural associations as Video Guerrilha, young citizens collaboration MOVA, and many more, demonstrated the interested of the citizens of Sao Paulo into their city and in the topic of re-appropriation of the public space. Finally, architecturally speaking, I will limit myself by mentioning only some of the sources consulted so to enhance the relevance of each of them into the different aspects. Firstly, the fascination for the Brazilian famous architect Lina Bo Bardi has played a huge role into my approach. The SESC Pompeia project has helped me defining the interaction between public and semi-private space into the complex as well as the artsy and freedom of the overall atmosphere, defining a successful positive precedent on the opposite side of the city, relatively to my area location. Following, the researched transformed project developed by Brazil Architecture Office in Piracicaba, Teatro do Engenho, and the Pinacoteca of Sao Paulo, developed by Francisco de Paula Ramos de Azevedo and Domiziano Rossi, have been particularly interesting during the definition of the architectural approach towards transformation, the materialization and the detailing of the my design. The search of the location. Being already sure of the country and culture I wanted to work with and given the transformation topic (in which I have always been interested in), I absolutely and deeply fell in love with the area itself. The history, the materialization, the opportunity for ‘trigger development’ through the cultural identity because of its interesting location. From here on, everything seemed to proceed with a smooth and positive approach towards the different issues and nevertheless the timeless time spent in the development of the design and the concept, nothing has been felt as a weight. Following, the contact with the local people from the university of Sao Paulo and the exchange of information with students of the architecture faculty allowed to have proper CAD and photographic survey of the current location. 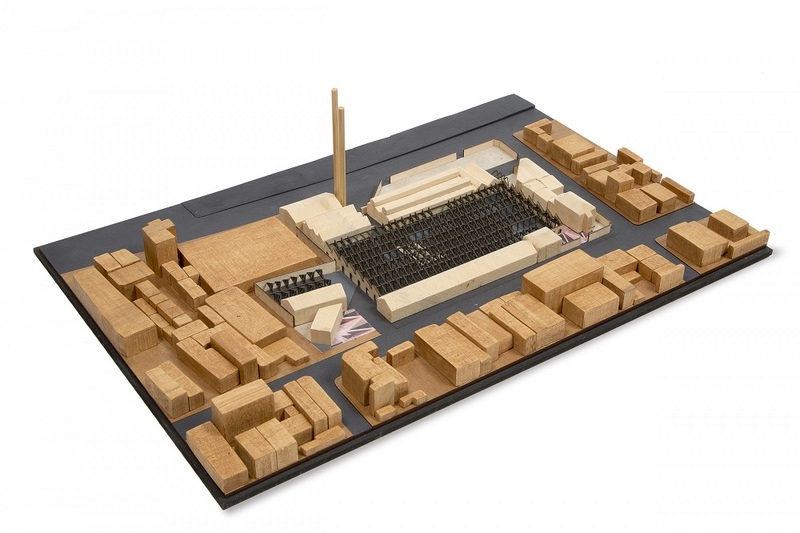 MuSeu was designed as part of the graduation studio ‘From industrial landscape to a place with cultural identity’. The aim of the studio was to transform dilapidated and abandoned industrial complexes into buildings that represent the future cultural agenda of the cities they occupy. The operation to reallocate began by defining the terms ‘transformation’ and ‘cultural identity’ as meaningful bearers of the project. Next, I looked for possibilities of using cultural transformations to trigger the development of the site’s context. It was my interest in troubled communities and in Latin America that informed my choice of the brief and the site in São Paulo. Tension between contrasting realities in the community there guided both the research and the development of the concept. In embracing the differences without denying the social context, MuSeu seeks to provide a platform for the cultural voices now to be heard in the different sociocultural layers in the city. The research question is how elements of street culture can be used to design a place where the experiences of those living in São Paulo can be made palpable for the city’s population and for those visiting it. The cultural centre is to stimulate future developments in the immediate vicinity so that those from the less advantaged social strata feel they belong here too. I chose the site of Fábrica de Tecidos Labor because of its promising potential for realizing these intentions. The urban context and its history were reason enough for me to choose the street – as a public space of experience – as the means for transforming the site. 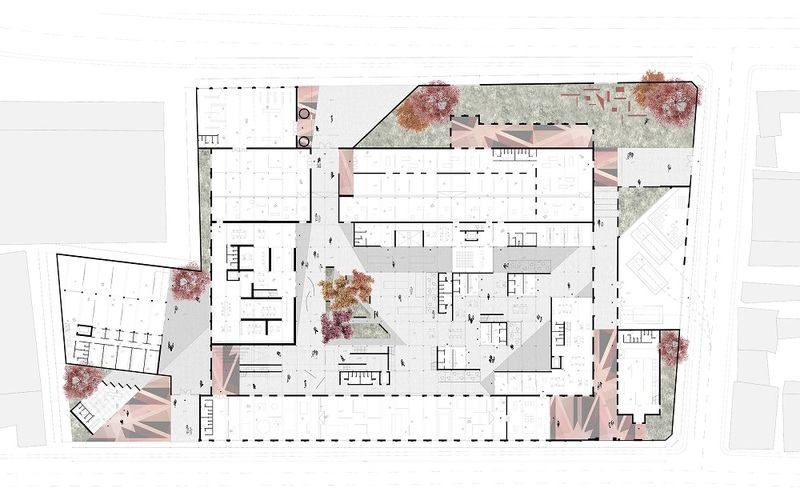 The conceptual street of experiences cuts through the large planning area. The radical transformation of the central area round this street where workshops dedicated to experiencing the senses are to be found, contrasts with the subtle transformation of the surrounding buildings with their charming fronts recalling the area’s industrial past. 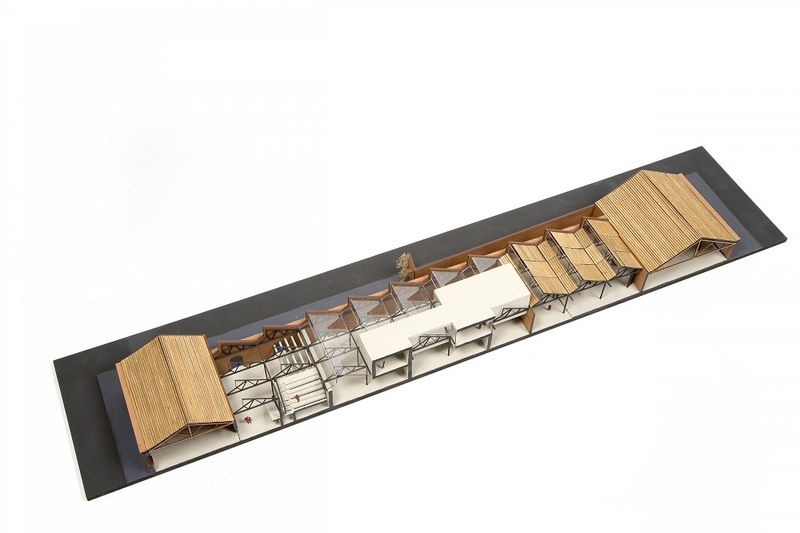 The industrial buildings along the edge house the museum and enable the project to slip seamlessly into its setting. The street passes among the ‘sensorial workshops’, determining their character but also that of encounters between locals and outsiders. The street is marked by the sequence of successive large and narrow spaces whose use is consistently reflected in their form. Most importantly, MuSeu seeks to create a circular system within the project’s three entities: the workshops, the museum and the street. The spaces are defined in terms of the five senses, the different activities and the scenarios that might arise through the choices made by the users. This makes the cultural centre a place created for and by the city and its inhabitants. Culture and character are qualities that need to be protected and displayed, with the appeal and the voice to arouse the curiosity of locals and visitors alike. I am working as Junior Architect at OMA office, since 6th February 2017. Topics related towards renovation, requalification and transformation of the architectural heritage into cultural points of interest has characterized my personal educational development. In my opinion, it is a contemporary topic which takes into account issues that will characterize our career as architects in the nearby future. Since I am convinced by the relation between architecture and social issues, the topic of cultural identity reflects my deep personal interest. Design requires an in-depth understanding of the surrounding social environment in order to be successful. Architecture firms such as OMA provide a wide range of possibilities to challenge yourself with different countries and cultures as well as work from small scale projects to large city developments. I have always been profoundly attracted by Latin America dynamics, where the extremely different realities creates tension in the social context, which the architect needs to face and understand, in order to properly integrate them in the design. Nevertheless the current interest, the office provides a lot of different opportunities, keeping the work exciting and inspiring. A successful architectural career is often characterized by personal features which allow yourself to feed the inputs received with further material, not necessarily architecture related. A stimulating working environment, which challenge yourself to work with different people and therefore personalities, allows you to be able to discern the useful and interesting realities from the unnecessary ones. The ability to become more and more confident in the process of decision making and understanding further more your own qualities and deficiencies enable to know yourself professionally more day after day. Therefore, the choice of OMA office is a great starting point to interact with a very various mix of people, cultures and projects. In order to acquire the management skills required to eventually lead a project, I am willing to take more responsibilities in every project I will be part of, without consider only my input as a task exercise but rather be actively involved and part of the decision making process. I therefore consider a large international firm, the best option to educate myself and better draw the line of my future career. Possibly, more experiences abroad will keep up the challenges, which I am willing to accomplish during the start of my career. As far as I am concerned, the long-term planning has been avoided since already few years, therefore all these consideration don’t exclude any independent route once established in my career nevertheless the curiosity of actively work in my country of origin.